My wife and I are the caretakers of a beautiful horse ranch in Bryceville, Florida. Pardon me while I dispense with some pride… we make a pretty good team. She handles the ranch and I post blogs to WordPress. Well… I do try to maintain the ranch’s equipment between blogs. When blades wear out on the mowers, I’m the man. If u-joints and wheel bearings need grease, I’m on it. So, should the fuel filter clog on Grasshopper, who you gonna call? No, not Ghost Busters… me! But when TC calls from the hay-field desperately pleading for a rake operator? Okay, let’s clear up what I don’t mean by rake… it’s not a hand tool with forked teeth on the end. Instead, it’s this massive piece of equipment with multiple wheels, protruding tines, cylinders, extending arms, and a partridge in a pear tree. Honestly folks, the farm I grew up on was equipped with two shovels, a hoe, and a worn out 8N tractor. But the equipment on this ranch looks more like something Luke drove into battle against Darth Vader. Believe it or not, with coaching from my wife, I managed to rake the hay for her to bale (Hoo-Rah!) But as we finished, TC received a phone call from the core building and had to run. Yeah, leaving me in a field with that ridiculous looking thing dragging behind me… but with its groping arms extended fully; making it impossible to drive back to the barn. I began to push buttons, pull levers, and yes… speak with a very authoritative voice to that rake thing. It didn’t listen. No matter what I did, the hay-rake ended up worse than before. Being the very flexible man who I am (and after about an hour of futile efforts to no avail), I came to the conclusion there was only one answer. Walk home. And so I did. Truthfully, while there are tasks that I perform and am considered to be very effective, operating shuttle-age agricultural equipment isn’t one of them. 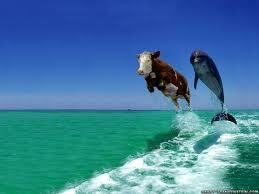 You might say I resembled a fish out of water… or maybe more like a cow in water. Fortunately, as Jesus builds His Church, He gifts His people with abilities so that scenes like the one above can be avoided. He gifts some to teach and others to give. Some are gifted to serve while another extends mercy. Paul was so engrossed with the urgency of believers getting this right that he used an illustration, when writing his first letter to the believers at Corinth (12), of the human body to communicate it. He equated the Church of Jesus Christ as His body. Leaning upon his analogy, and mine, consider the ugly scenario if your mouth woke up one morning and decided it wanted to be your feet. This entry was posted in WordPosts and tagged blog, blogging, Christianity, faith, inspiration, Jesus. Bookmark the permalink. Thank you Carley. God Bless. For starters, I love your picture, your wit and your humility. And I love the Dunn quote. A homogenous group would make us more like a Borg and a Body. 🙂 Thanks for sharing your story – made my night!